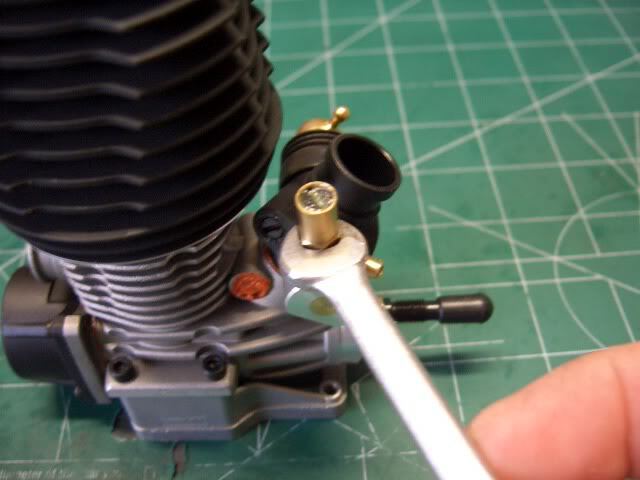 As this topic has come up numerous times recently, here is a copy of good directions on sealing up a nitro engine. 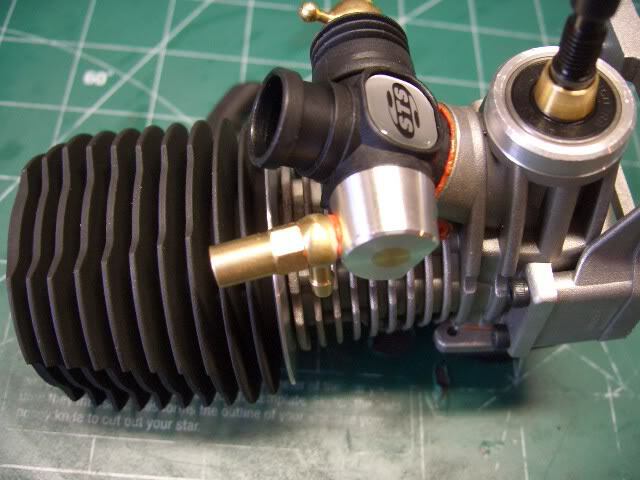 Today I will take you step-by-step through the process of sealing your engine. Whether your engine is brand new, or you have been running it for a year or more, if you have never sealed it, now is the time. By sealing your engine from the beginning, you are eliminating most of the tuning problems that plague nitro engines. If you are having trouble keeping your engine tuned properly, chances are you have an air leak somewhere on your engine. By following this easy to follow guide, you will be well on your way to having a trouble free engine. 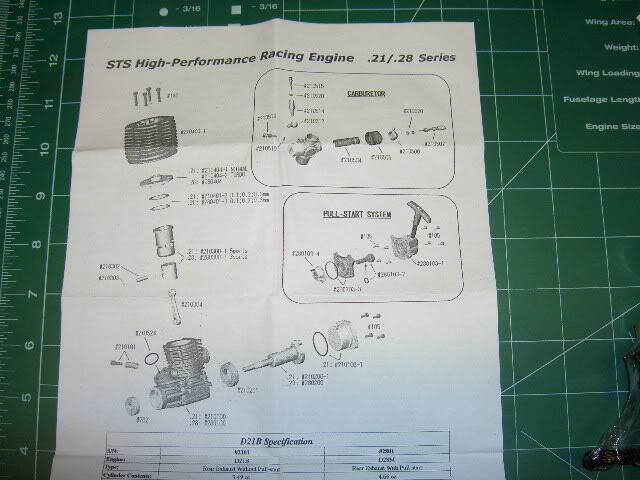 The engine I am sealing up today is a new STS .28. Now your engine may be slightly different, but the process is essentially the same for all nitro engines. First off you will need a clean work area. 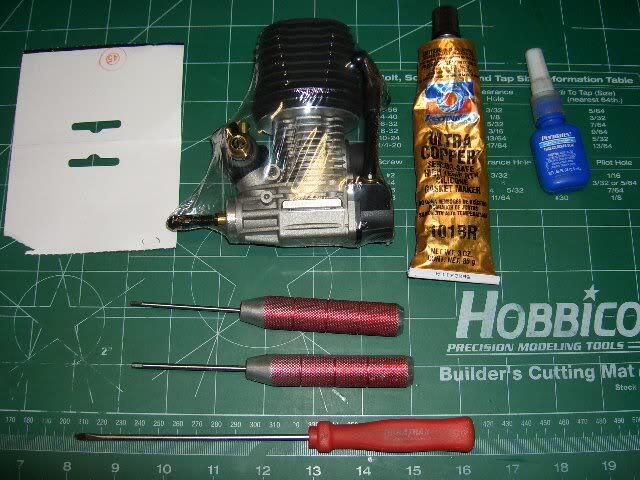 I like to use this Hobbico cutting mat. Give the area a good wipe down to eliminate the chances of foreign debris entering your engine. and a couple of things that didn't make it in the pic is some Team Associated's Green Slime grease, and some good nitro cleaner. Another good thing to have with you as you dissassemble your engine is the manual that came with your engine to refer to so there are no suprises along the way. Now go ahead and take off the pullstart, backplate and head. I like to use the lower part of a fuel container to put metal parts into for cleaning. You want to clean the areas you will be sealing so that the silicone can get a good bond to the metal surface. I also like to go ahead and pull the sleeve out for a close inspection. Now be careful doing this because you don't want to damage this important part of your engine. Check it carefully for any burrs, or loose shavings. Do the same for the rest of the engine. 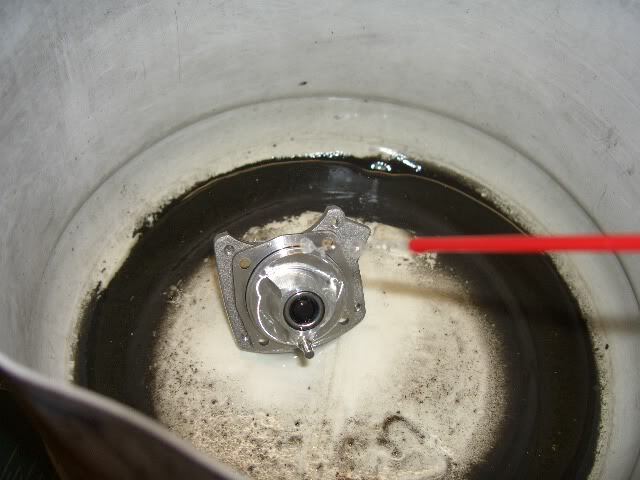 look inside the crankcase for any burrs and/ or shavings and remove carefully. 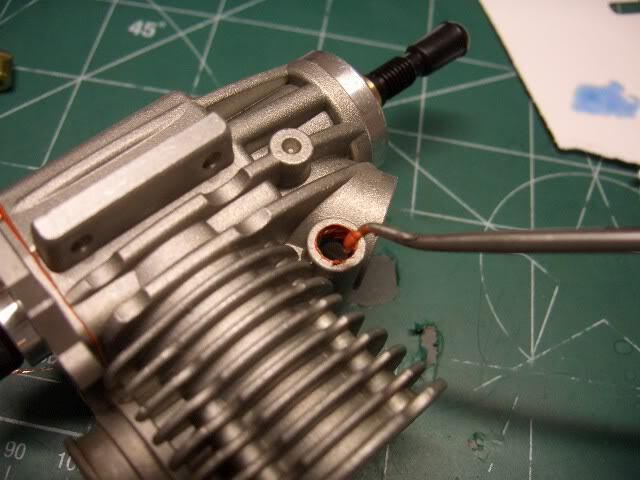 My other STS .28 engine had a piece of metal shaving in the crankcase. Now take a clean cloth with some nitro cleaner on it and carefully clean the back of the crankcase (where the backplate bolts on). This will ensure a perfect seal for the backplate. Most engines have an o-ring on the backplate. There is no need to mess with this- let it do it's job. We are just going to add some extra insurance by sealing the backplate. Squeeze a small amount of silicone sealer onto the thick paper. 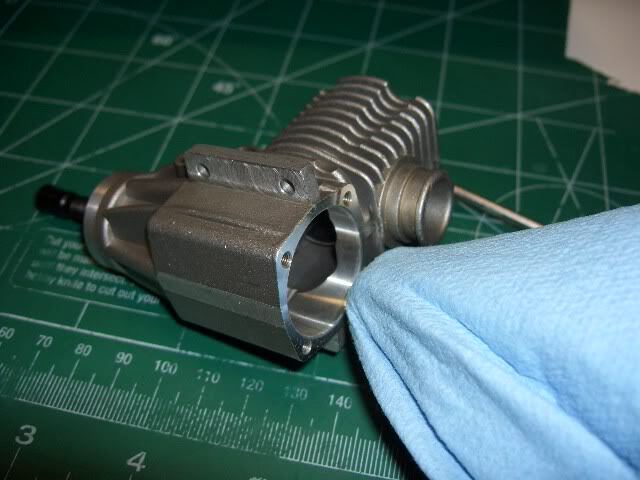 Dab a little on your finger and put a very thin coat on the mounting surface of the crankcase. Now place the backplate back on the engine being careful to align the crank pin on the crankshaft. It is important in this step to use loctite on the screws that attach the backplate. I like to use blue loctite, but HPI recommends red. Red loctite is HIGH STRENGTH and makes it very difficult to remove if used on small screws like the ones used on our small nitro engines. Also, loctite the screws that hold your pullstart on as well. remember you don't need to crank down the pullstart bolts, they just need to be snug. Here the backplate is loctited into place. Rememer to use the X- pattern when tightening the screws. Next we will seal up the carburettor and pinch bolt. 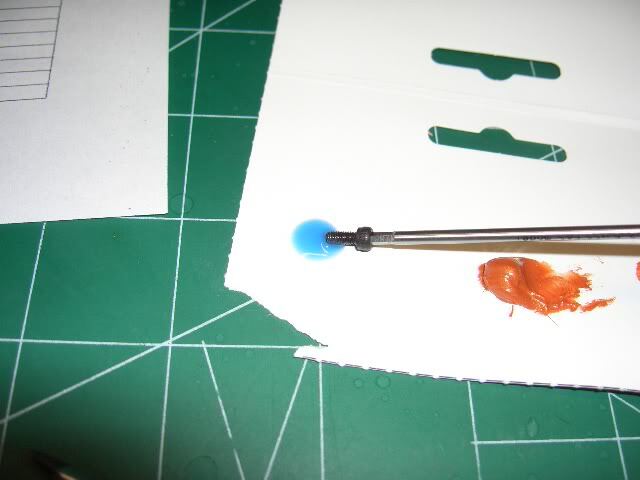 Start by applying a thin layer of silicone around the inside edges where the pinch bolt goes. Do this on both sides of the engine. 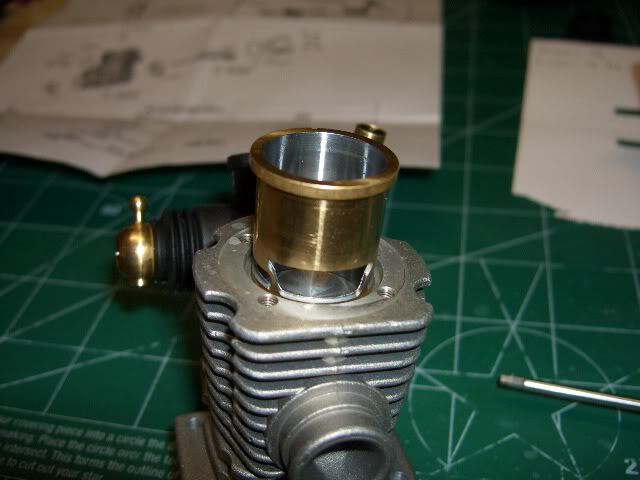 Next add a small amount of silicone to the upper neck of the carb. 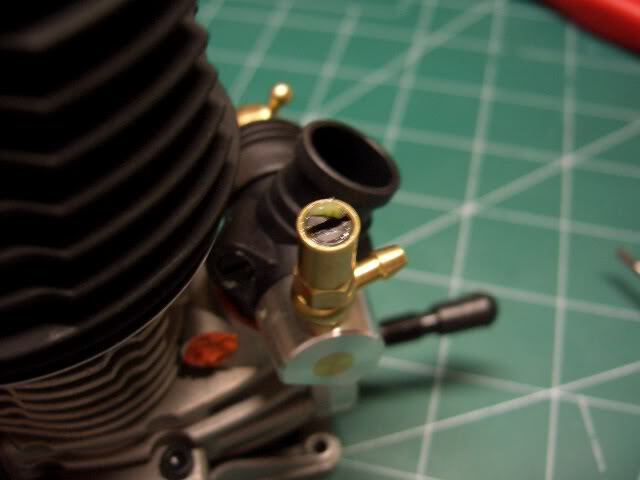 This engine has an o-ring down in the block to seal the carb opening. We are not going to mess with that- let it do it's job. We are just going to add more insurance by sealing the upper neck of the carb. Slide each half of the pinch bolt together from both sides and get the bolt started. 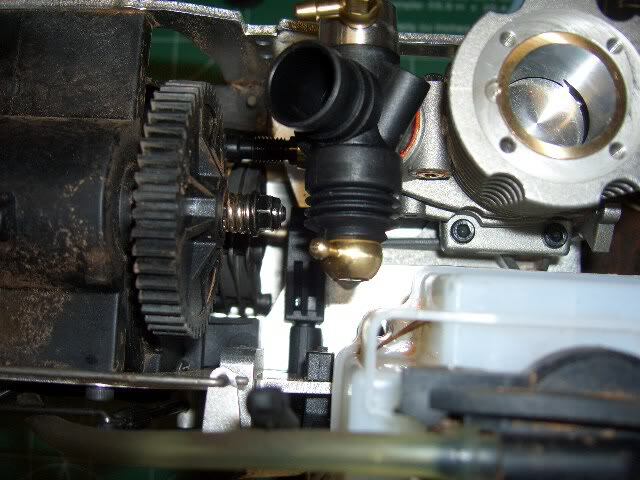 Now at this point, you want to go ahead install the engine mount and set the engine on the truck so you can set the angle of the carb and make sure there is no interference with the fuel tank when the carb is fully open. 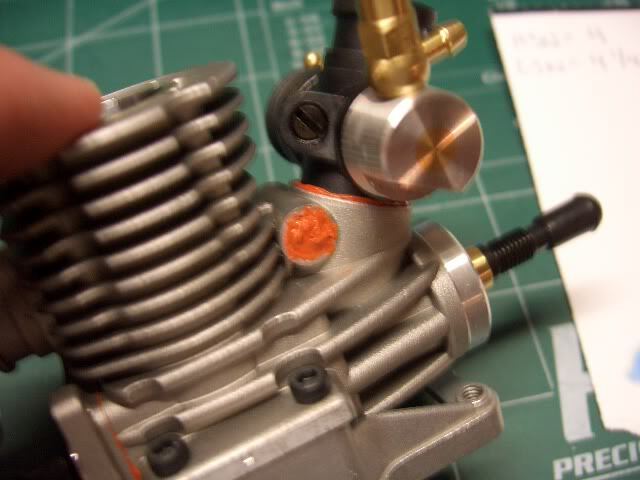 Once you are happy the angle of the carb, tighten the pinch bolt and seal up both sides of the pinch bolt by completely covering them. Do this on both sides. Now we are going to seal the carb needles. Before you begin, hold the carb closed with one hand and tighten the high speed needle until it stops carefully counting how many turns until it is fully closed. 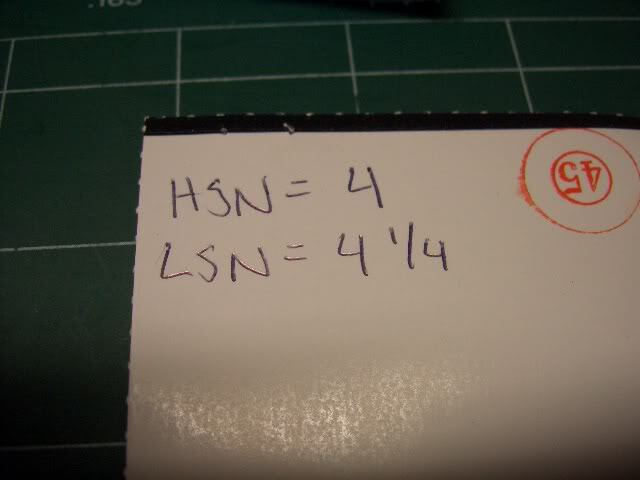 Write the number down and do the same for the low speed needle. These are your base settings from the factory. This is a good thing to do any time you get a new engine because alot of engine manuals don't mention the factory carb settings.settings. Ok, go ahead and un-screw both needles and the idle speed screw. 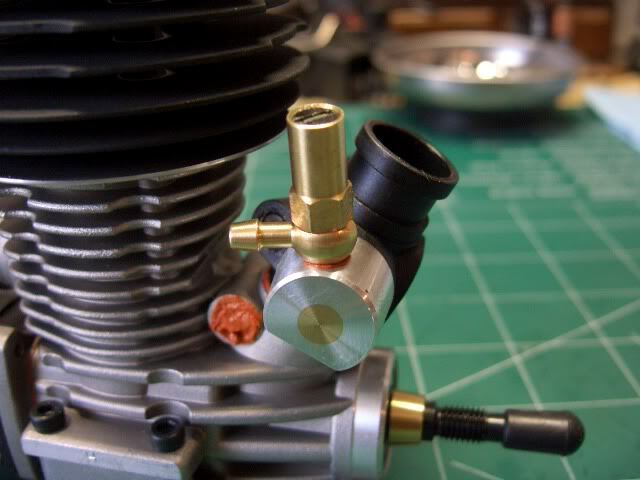 Look into the needle housing for anything unusual like o-ring shavings or any foreign debris. The Wasp .26 engine was notorious for having o-ring shavings or "worms" as they were called. They will give you headaches when you are trying to tune your engine. Now grab your tube of Associated's Green Slime and put a small bead on the o-rings of the needles and re-install them by screwing them all the way in and backing them out to the settings they were at before you touched them. Be careful to to tighten them too much during this process, you can ruin them by cranking down to hard. Now we are going to re-seal the fuel inlet fitting. 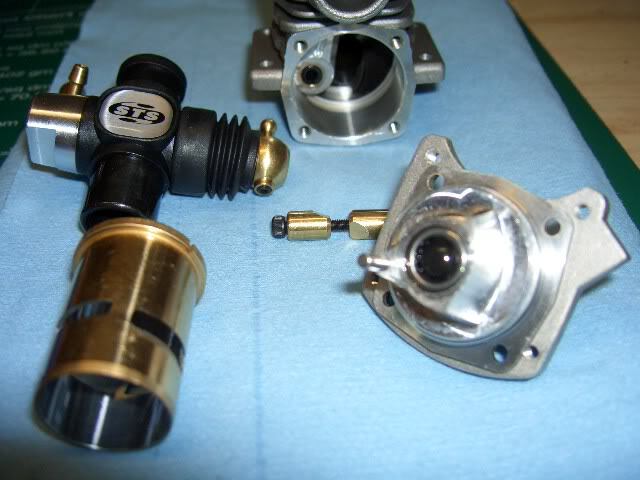 Most carbs have a gasket on both sides of the fitting. 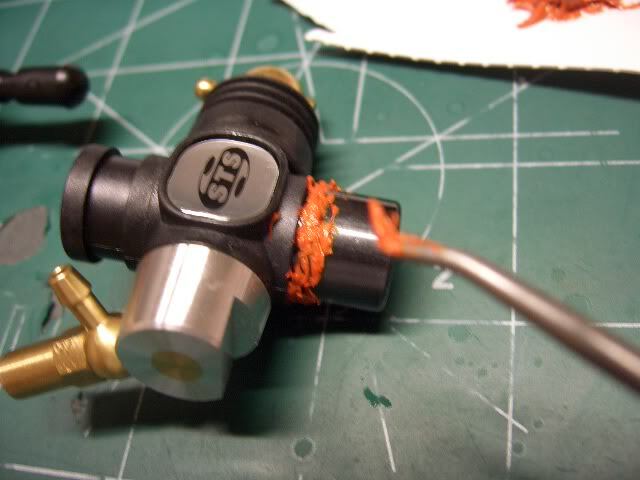 If it does, I like to take the gaskets off and apply a thin layer of silicone on both sides of them and re-install. 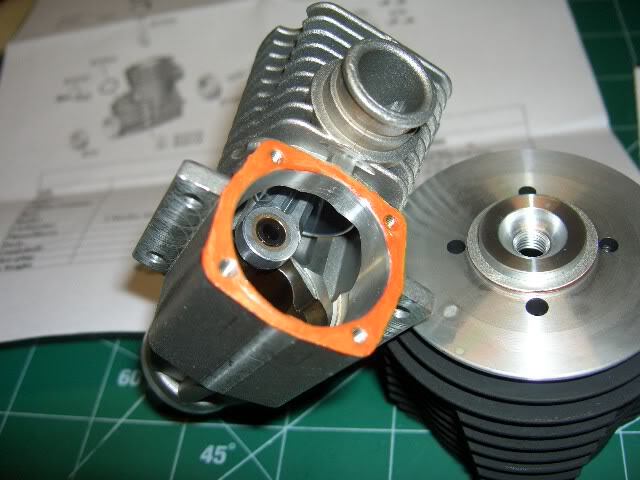 Now this particular engine does not utilize gaskets, it just uses a tapered seat, so I will apply a small amount of sealer to the mating edges of the fitting and housing being careful not to use too much because this fitting can be easily clogged by too much silicone and cause you all kinds of trouble. 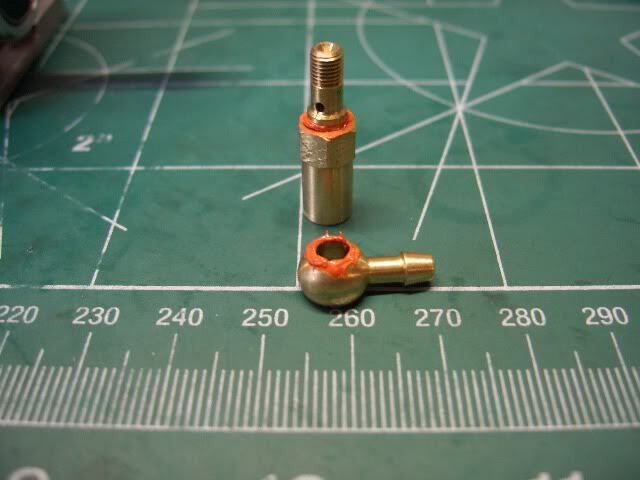 Be very careful with this brass fitting when tightening as it is very soft and can be easily broken. You don't have to wrench down hard, just snug. Be sure to point the fitting rearward for the Savage. Well that's pretty much it. Just let the silicone cure for 24 hours before firing up the engine. By doing this you will save yourself from a lot of headaches concerning your engine. I've used this guide word for word on every engine I've had/have. It's like proactive maintenance imo, and has made some tuning issues easier. I had not thought of this, but is makes sense (I think). Does the manufacturer not already do this? Do these sealants not contain acetic acid?? Which I believe reacts to disparate metal types (and with these being an ABC....) or has this been mitigated some how? I saw a video from someone not in the company who stated to check for leaks by putting the engine under water. I am missing how that works. Don't these engines only seal when running (I assume it uses a hydraulic seal instead of the front bearing) so not sure how it can seal when it's not running?? Please forgive my ignorance because I'm trying to piece all this together. I did the run/stop/cool, run/stop/cool method for my running in. How will I know it's okay to adjust the air mixture? Is performing the method described above mandatory before making the air mixture adjustments. I don't mind doing it but want to be cautious as I am a complete rookie. Or is it better to simply adjust the air mixture and then if signs of a leak are present seal just that area? Thank you for your response and your patience while I learn these little 2-stokes. The manufacturers do not seal these engines. Personally, I would take apart every engine that I buy. New or used. That way you can tell if there are issues and can resolve them before start up, this can result in less failures. Sealing it is simply good insurance. While it is not 100% necessary on all engines, many have some form of air leak causing different levels of tuning issues. As far as tuning, you will know when you should start tuning for power. I know that may be difficult to understand, but once you've tuned a couple engines it will become obvious. You may do some adjusting before this in order for the engine to stay running during break in. There will be a fairly noticeable change in how the engine is running, and performance. This can take different amounts of time for every engine. Keep in mind, the longer you allow for break in, the better. get a temp gun and monitor engine temp at the glow plug. When new to this, this is good insurance. follow the recommendations in the manual to play it safe. There is a lot of info about tuning on this site and others, do a lot of reading and learning, if you are technically minded, you will enjoy the experience. A neighbor has a son who actually races the buggy versions..as in he gets paid and travels to events around the nation. I thought it was just him, but his dad (who got me in to this hobby) goes with him and said he takes care of the vehicles (he is the chief mechanic) lol. I asked him about the thermal temp monitor and he said I am too late as it is only needed during run in and not air mixture control ('fine-tuning it'). He explained that an engine having too much air/too little lubrication will exhibit signs such as stuttering during throttle engagement. I asked if I should still use one since I was new and he explained temps vary from not just engine to engine but types of temp guns yielding false/positive results. 1. After taking the first temp, he placed the temp monitor close to the exhaust which left a residue of film on the infra lens of the temp gun. 2. In reality the engine temp was higher the second time but the instrument yielded false results. 3. He then wiped the lens clean yielding in more accurate temps the third time. On a side note he is taking me and my grandson to the local rc track this weekend. My grandson (who is 15) wants a buggy after seeing my neighbors' collection as they do not allow HPISavages to enter races. I am sorry for writing such a long reply; it's just I found this demonstration quite interesting and thought I would share with everyone. I agree completely, the temp gun is only an additional tool. Smoke, sound, response, pinch test, glow plug are all to be considered when determining if the engine is in a safe zone. Just added insurance. Is the pinching test what is used to monitor the RPMs based on amount of fuel that has loaded up? I've read that but have not adjusted my air mixture yet as I have just completed the running in so I think. My neighbor has a torque driver he uses to determine the amount of pinch left in the tapered cylinder (by moving the piston to the top of the stroke he can determine if the running in is complete and ready for air mixture based on torque setting). He informed me each engine is different. Does anyone know the amount of 'pinch' the stock engine's cylinder should have before it's ready to be leaned out via the air mixture controls? I can move it by turning the flywheel but unsure how much torque should be applied when it's broken in. I got a question that may seem dumb to other but I rather be sure about it. Do u not out any sealer on the cooling head? Oh ok thanks I kinda figured it wasn't needed but wanted to make sure. Oh yeah I'm a noob! First off you will need a clean work area. I like to use this Hobbico cutting mat. Give the area a good wipe down to eliminate the chances of foreign debris entering your engine. Here are some things you will need: A tuning screwdriver, a couple of good hex wrenches, blue loctite, silicone sealer (I like Permatex Utra Copper), your engine, piece of scrap thick paper (I use package tops) and a couple of things that didn't make it in the pic is some Team Associated's Green Slime grease, and some good nitro cleaner. 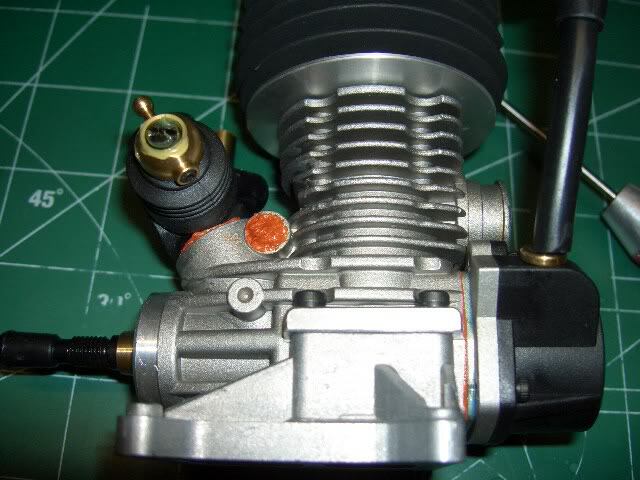 Most engines have an o-ring on the backplate. There is no need to mess with this- let it do it's job. We are just going to add some extra insurance by sealing the backplate. Squeeze a small amount of silicone sealer onto the thick paper. 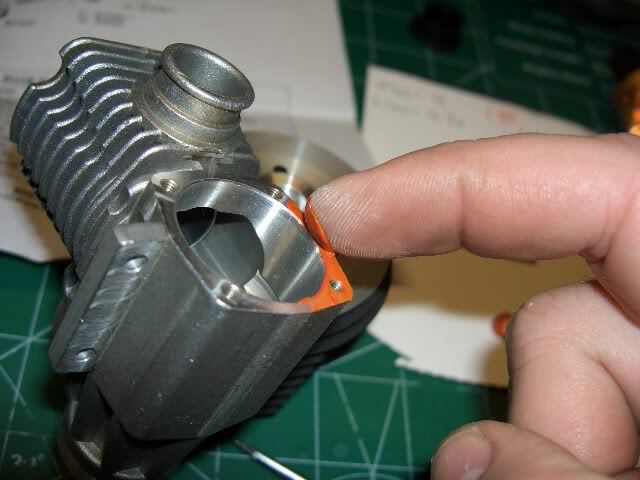 Dab a litle on your finger and put a very thin coat on the mounting surface of the crankcase. Now place the backplate back on the engine being careful to align the crank pin on the crankshaft. It is important in this step to use loctite on the screws that attach the backplate. I like to use blue loctite, but HPI reccommends red. Red loctite is HIGH STRENGTH and makes it very difficult to remove if used on small screws like the ones used on our small nitro engines. Also, loctite the screws that hold your pullstart on as well. remember you don't need to crank down the pullstart bolts, they just need to be snug. Well that's pretty much it. Just let the silicone cure for 24 hours before firing up the engine. By doing this you will save yourself from alot of headaches concering your engine. 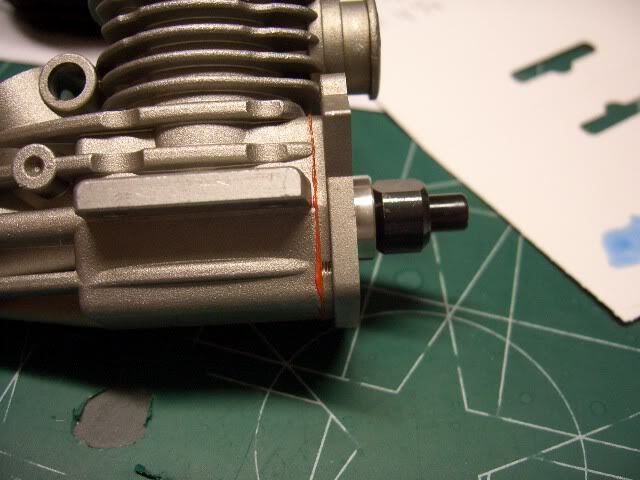 I also seal the Carb slide diaphram where it meets the base of the Carb and at the end where the low speed needle is as this has been a point of air leaks for me. Big thanks to @olds97_lss for recovering the images in this thread from the photobucket grave yard. I've also saved the photos to our server now and have also updated the first post to make it usable again. Also in the LRP there are two gasket.. and if you look inside to center the hole, it's not completely leveled (it's about 3/4) .. it's normal? Here is a pic of your engine , Carb towards front , Exhaust towards rear no problem. 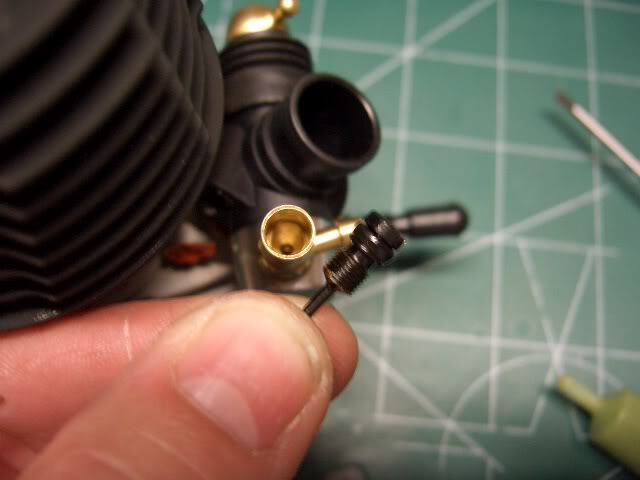 If you are referring to the CARB position see below part(s)# 1434 you can loosen the the CARB lock pin and then removed the CARB and turn 180 and put back in. 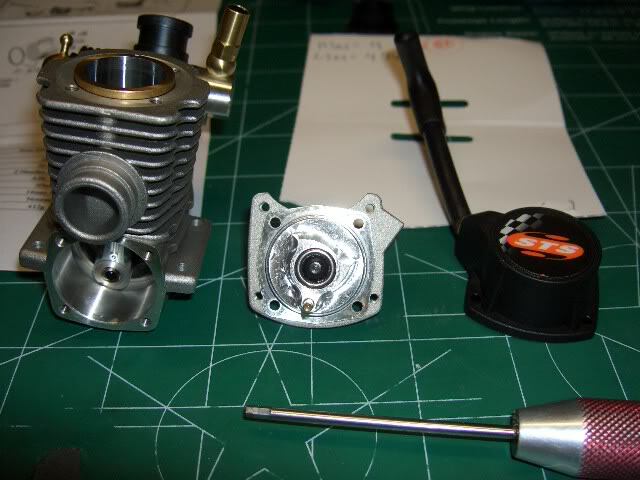 I turned the carb 180° already, since the savage XL has the throttle on the left side. You do know the inlet can rotate any way you want right?? You mean that I haven't to align the hole of the two pieces? No, it's a banjo fitting and there's a groove/channel in the banjo part for fuel to flow around in. You just need to hold the inlet where you want it pointing, then tighten the HSN assembly down to keep it there. It will allow fuel flow regardless where it's pointing. Yep. You just want to be reserved as to how much sealant you use so as to not get it inside the banjo fitting. Just a very thin skin on the top/bottom of it should do the job.